In Autumn and Grapes in Basket tapestry we see nymphs in the garden harvesting grapes and flowers. It is a celebration of the abundance of spring as we see their baskets strewn with grapes and other fruits on the river bed, among trees showing golden leaves, surrounded by a border of grapes and vines, to complement the theme. 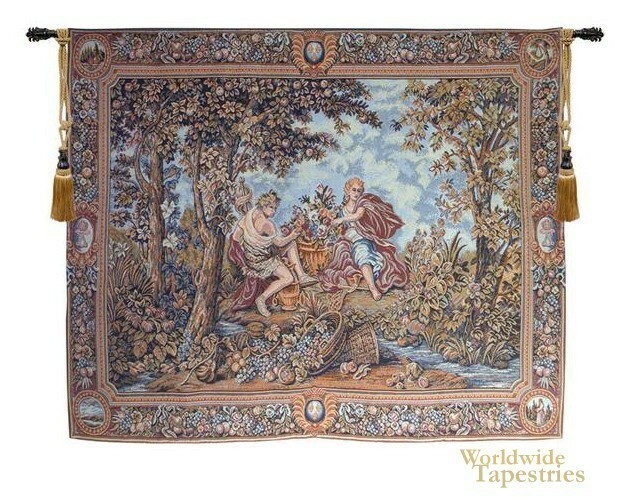 This tapestry is backed with a lining and a tunnel for easy hanging. Note: tapestry rods and tassels, where pictured, are not included in the price. Dimensions: W 53" x H 41"